This isn’t a typical podcast episode, but I had a few things I wanted to share during this month-long break in December, so I’m just popping in to your podcast player for a few minutes. 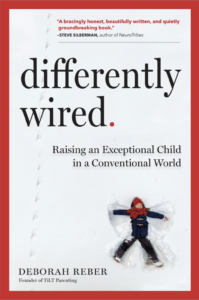 In this mini-solocast, I share an update on our family’s relocation from the Netherlands back to the US, announce the release of my TEDx talk that I delivered at TEDxAmsterdam on November 29, 2018 entitled Why the Future Will Be Differently Wired, and share the news that the audio version of Differently Wired is now available on Audible. I also give you a preview of Understood’s new podcast for parents raising kids with learning and attention issues, called In It. The podcast premiers at the end of the year, and based on the trailer and what I’ve heard from hosts Amanda Morin and Lexi Walters Wright, it’s going to be a must-listen-to.